Ron Howard has been active on social media more than ever before, giving the fans an inside look at his Han Solo spinoff. After teasing a number of events and locations from the rogue smuggler's colorful past, he's now revealing that two fan-favorite characters from the non-canon Star Wars comic books are about to make their big screen debut. Get ready for Tag and Bink! Howard posted a tweet featuring screenwriter Jon Kasdan and assistant director Toby Heffernan as the comedic Imperial officers, who are frequently called the "Rosencratz and Guildenstern" of Star Wars. I think of them as the Forrest Gumps of Star Wars. 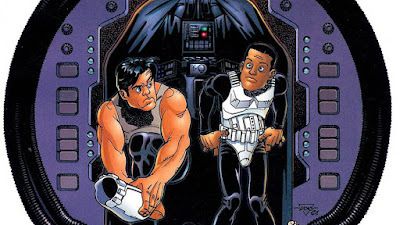 In the Dark Horse comics in which they appeared they basically rub shoulders with every major character from both the original trilogy and George Lucas' prequels. Tag and Bink aren't the first non-canon characters to make the move into the new continuity. Grand Admiral Thrawn from the bestselling Heir to the Empire novels debuted in Season 3 of Star Wars Rebels. The untitled Han Solo movie opens May 25th 2018.